I’ve never grown romaine, but as you can see I am protecting it well. Those little 13 line ground squirrels (I was corrected by a wise man, they are not Chipmunks) are aiming to take out my garden, well take that you little thieves. I worked with my daughter to make a bunch of these cages out of hardware cloth. Hubby made some too. It will be great for next year to have all of them ready to go. It really saved my little plants. Now they are so big I have removed almost all except for those that house the small and vulnerable. The first flush of Shiitakes was wonderful. We ate them in eggs, and with asparagus and garlic scapes for days, and then we decided to preserve the bounty and dry a bunch for Winter. They turned out wonderful. 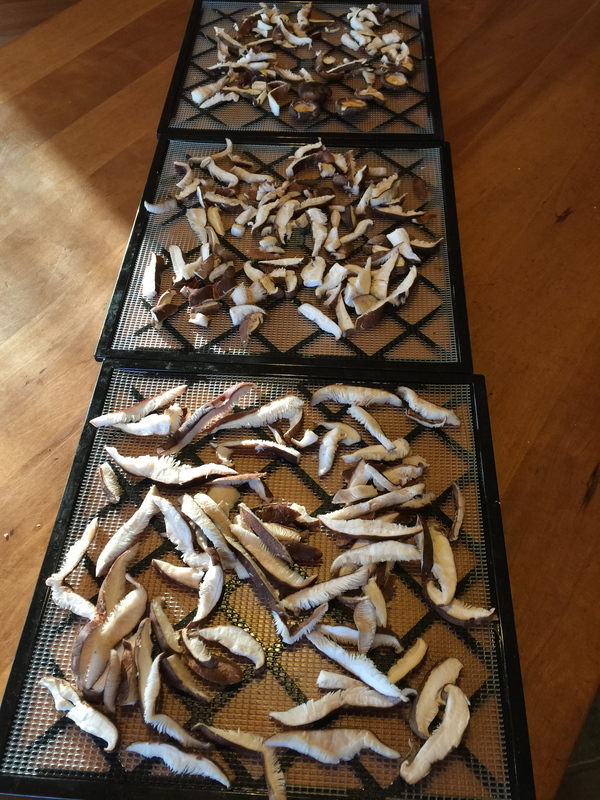 I now have dried Shiitakes, dried Morels, and dried young Pheasant Backs. 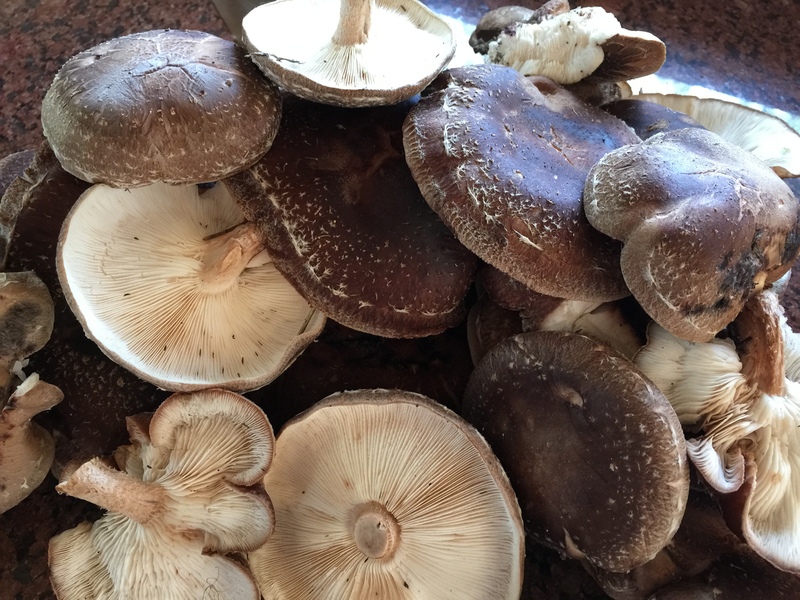 We will have mushrooms all Winter, especially since we will get a few more flushes of Shiitakes yet this year. 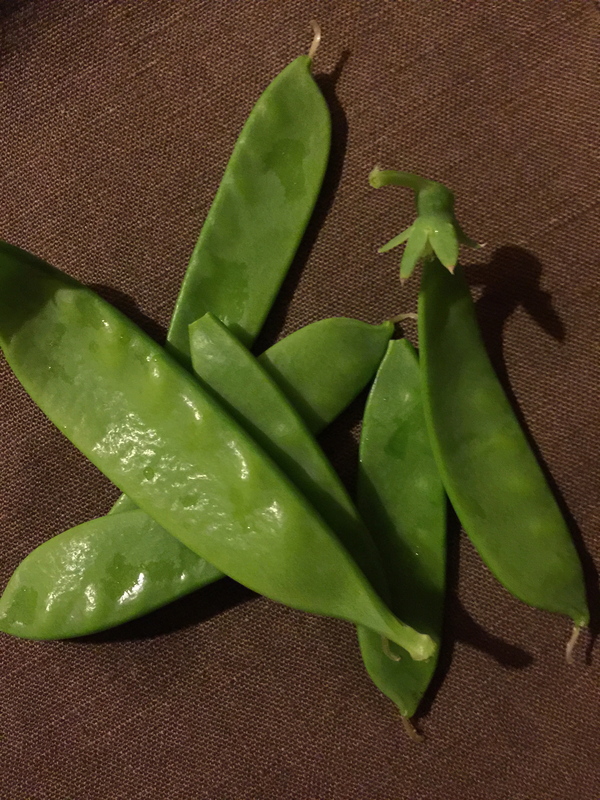 The snow peas I grew in the mini high tunnel have started to come in with a good handful every other day. Should be more than that soon. 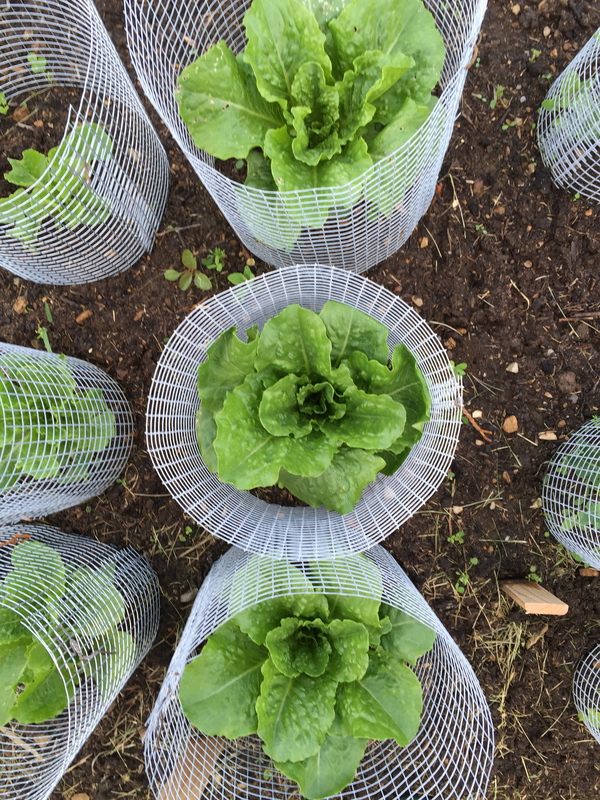 Our high tunnel has a plan as I have mentioned before. I had it on the bale wall and started early Spring things like radishes, lettuces, spinach etc., last February. I also started some Peas and Beans early and that was an experiment. It turned out pretty well except I accidentally put pole beans in there and of course they climbed all over the tunnel. I had to pull them out so we could take the tunnel off and ready it for the Chickens that are all too ready to get in it, and be outside. After they are butchered in August it will go back on over my July starts for cold crops. This should keep growing food till early November or longer if things don’t get crazy cold in November like they did last year. Come February I will plant it again for early Spring veggies. So it is a multi-purpose unit and I love that. Every time we build something with two purposes, it seems to get double the value for the money spent on it and the time hubby invests in building it! Here is the tunnel before we took it off the bale wall. It was sad pulling all the green bean vines off it. Hubby put in some fence for them to climb on should they decide to try and survive the trauma of being pulled off the tunnel. When it is a chicken tractor we have a shade tarp on it, so that will be going on soon. We also have a coop that pulls up to the the window you see and they can take the plank up through the window to get to the mobile coop. This year we are trying new things. We will try our first real free range birds! I hear about people doing it all the time and occasionally they lose a bird. Since they will have a run with an attached coop available, I think it is the best scenario to try it. When ours have gotten out for a minute they look so nice enjoying the whole yard. I will however only do this with 8 roos! The new hens will head to the winter coop and the current hens will be in our older chicken tractor. The rest of the 42 birds will be split between two chicken tractors that hubby is working feverishly on right now. Somehow time got away from him and they birds are big and screaming to get out of the brooder and get on grass. They should be out there by Monday. This also is new, we will run them up and down in an area considerably removed from the house. They need to be really secure up there, so he is making a maximum security roosting area at night. I drooled today over an automatic chicken door that opens and closes based on longitude and latitude which determines sunrise/sunset. I never thought I would drool over such a thing! It will be tough getting up the hill at 6 am each morning, but I suspect I will see some wonderful sunrises which might even turn around my grumpy state at that hour. Fortunately it will only be for 5 weeks. Admittedly, 5 kind of long weeks. This was one of my “catch ‘o the day” pictures. The eggs of course were cooked in bacon grease, so everything we ate was from the farm that night. This is the run around the winter coop. 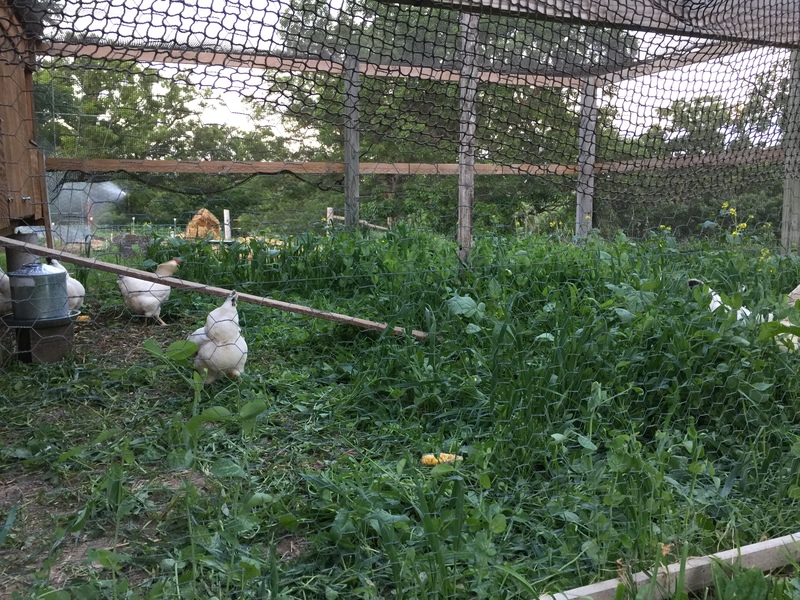 The laying hens are in there now eating down some peas and weeds! 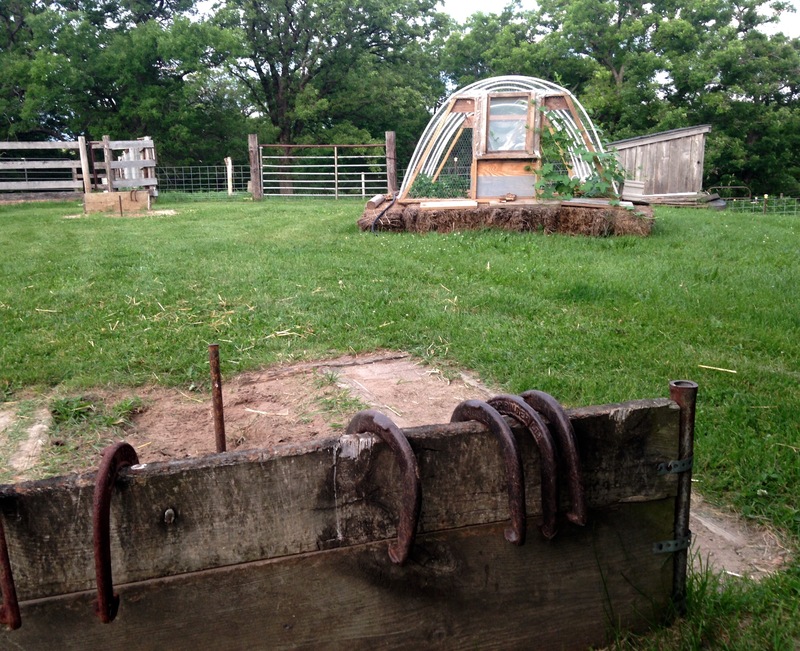 The coop will get cleaned up for our new hens to move into this weekend. These ladies will go in the older tractor with attached coop. All said, we will have two new chicken tractors with 21 birds in each, and one older chicken tractor with our current 6 laying hens, and 8 free ranging birds that will be in a coop at night and 8 new hens in the winter coop and run. There is a whole lot going on in Chickenland here. Next year with not having to build new tractors it will be an easier year! Each thing we add to the infrastructure around here, makes the next year a little easier. Even our brooder this year is one that can come apart and get put back together next year. I think Hubby is even on board with putting doors on the long barn so that we can have the brooder, and all it’s dust, in the barn and not the garage next year! Now that will be a real treat! As it gets late in June the weeds are in full and the new plantings are still small, so I have been doing my best to keep up. So far I have been keeping up fairly well. I don’t have the best weeding back, but if I do bits of it here and there I can keep up. It’s a fine line of knowing when not to push myself and knowing when I need to push myself. So far, it’s working and my gardens are actually less weedy than ever! Tonight I gathered together the things I made for my friend for her birthday. A scarf I finished but not in time for last year when it was cold at holiday time, some oregano I dried, sliced dried garlic scapes, and some dried raspberry leaves for tea. It was a fun present to put together. I am hoping it isn’t this long between posts again. It’s a bummer that between my business, the farm and family commitments it has been weeks since I have posted. It’s a bummer for more reasons then just missing out on things that I wish I had captured on here over the last few weeks. It’s a major bummer because I love this blog and the time, pictures and thought that I have put into it. I love the chronology of where our journey started and our path along the way. So I don’t want to fall into the busy trap. I think busy is not a state, as we often imply, it has a causative agent, and that is over planning and time management issues due to over planning, this only leaves me feeling stressed from busy and a failure at the same time because I didn’t get everything done that I imposed on myself. So, I am ready to pay attention to that word “busy” again, because it takes away from me, when it becomes a state of being. I was doing quite well at this and paying attention to it, and since Spring hit I fell in the trap again. Now, to start up some yogurt, and clean up from a wonderful completely farm dinner of baked chicken, last year’s corn and broccoli, and raspberry applesauce. I am still working on finishing last year’s supplies! 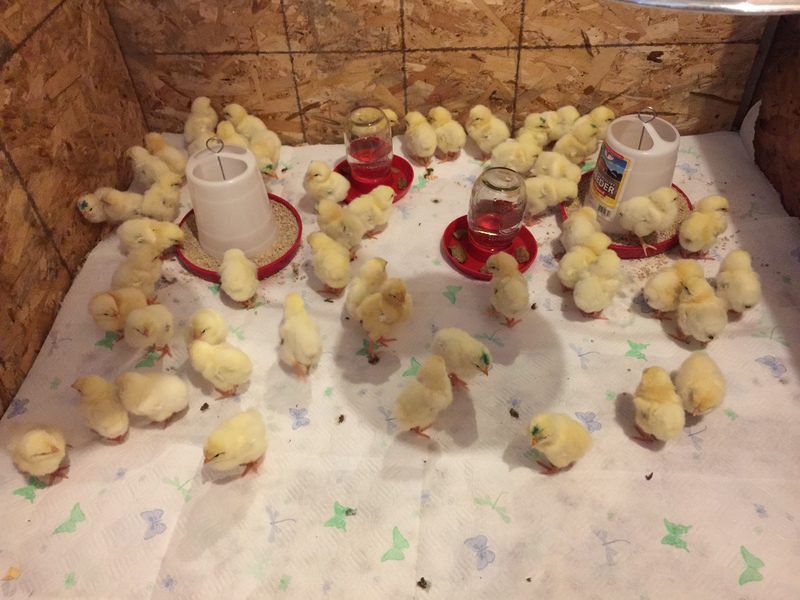 You might ask why 58 chicks? Well, 50 roos would provide us more than enough chicken for the year, with plenty to barter with as well, and we wanted to have 8 new hens to take over for our current hens when they slow down. We made a tough decision a couple of weeks ago. We will not be raising pigs this year. Last year we raised pigs and had pork all year, and with the 25 chickens we processed we were set. We decided that last year was a pork and chicken year and this year will be a beef and chicken year. We have a lot going on this year on the farm. It looks like we may have a couple of calves coming soon. By the way, I am not in charge of breeding here, and hubby’s method of breeding is what (I tease him and) call the “baby maybe” breeding plan (reference here to a great George Carlin line). Our bull just hangs with the ladies year round so we can absolutely expect that we never know when we are expecting. We will be processing said bull this summer, and one of our steers, so we will have lots of beef. We will be getting our freezer licensed (as soon as we get the chicks out of the garage where the freezer is, lol). So with all the chicks, and so much beef and the possibility of calves and the fact that we doubled our garden space, we decided to let the pig idea rest for a year. When November comes around we will trade chickens for pork and that will work perfectly. 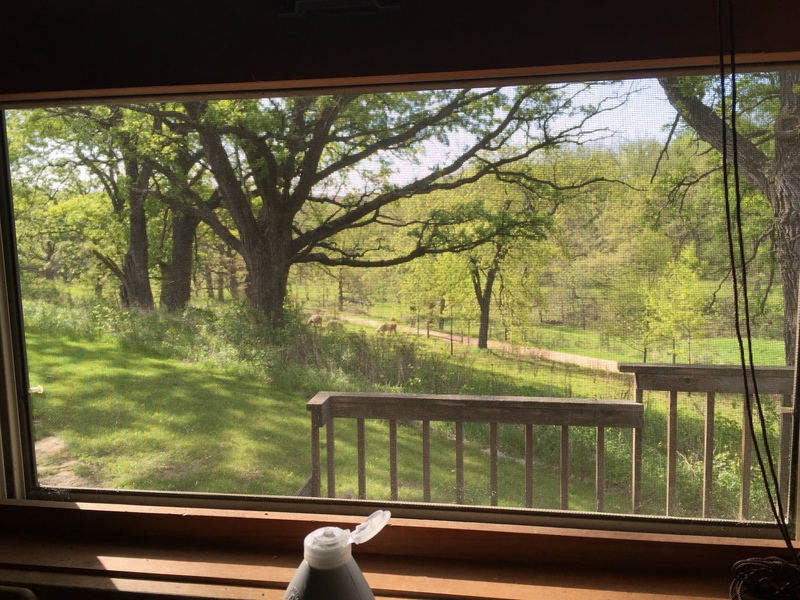 When we were building the house and it was just walls and sub floor, I remember standing at this window, which had no window in it yet, and saying this will be my “doing dishes view”. As I did dishes the other night I totally enjoyed watching the cattle work the hillside. How could doing dishes be bad with this view? Looks can be deceiving. This bread looks delicious right? Wrong. I won’t be making this recipe again. It was completely boring. 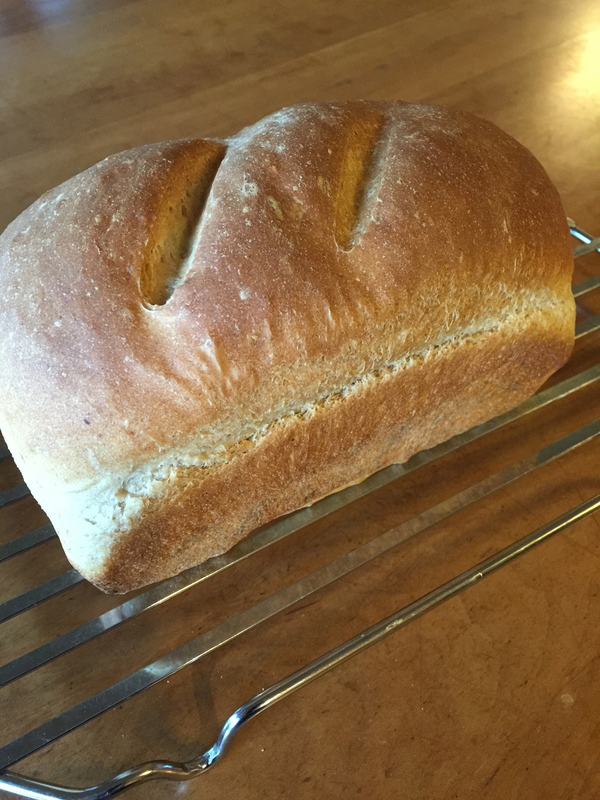 I will go back to my go to no knead bread. The only problem with the no knead recipe is that if you don’t do your math right, it will be ready to go in the oven at 3am! The mushrooms keep happening! They are awesome. 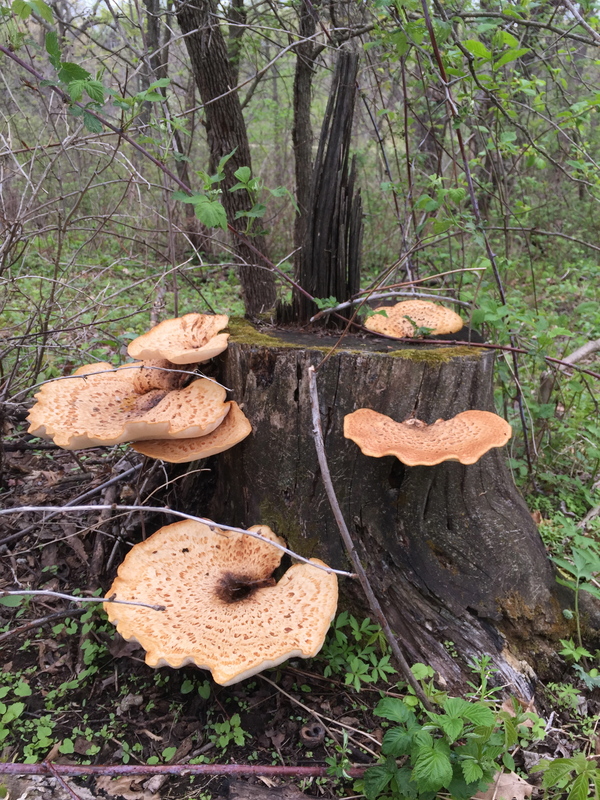 I hear, from my mushroom ID facebook group that the Chicken of the Woods are coming out in areas near us, so I better get out to the woods and check before I miss anything! These Pheasant backs were good sauteed but only the edges, these ones were so big they rest of them were better for making mushroom broth. Speaking of the hunt! 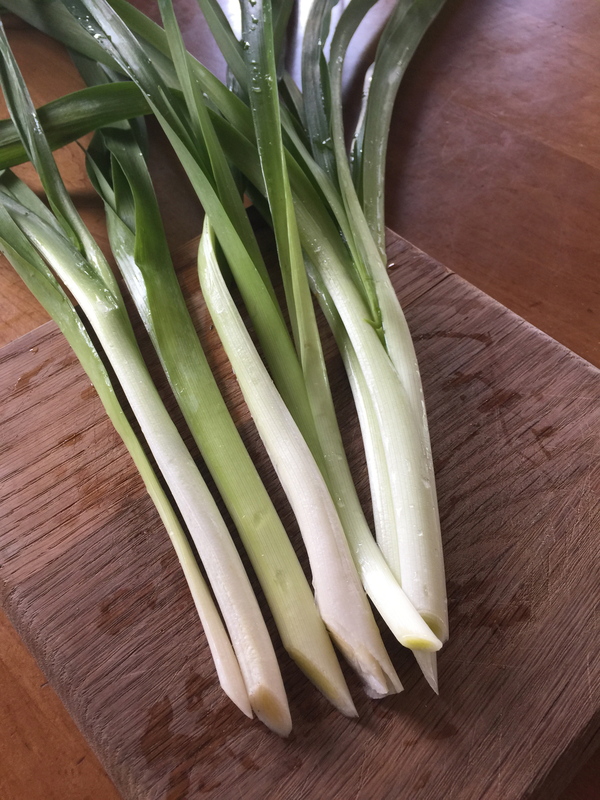 These are day lily stalks, and they were delicious! 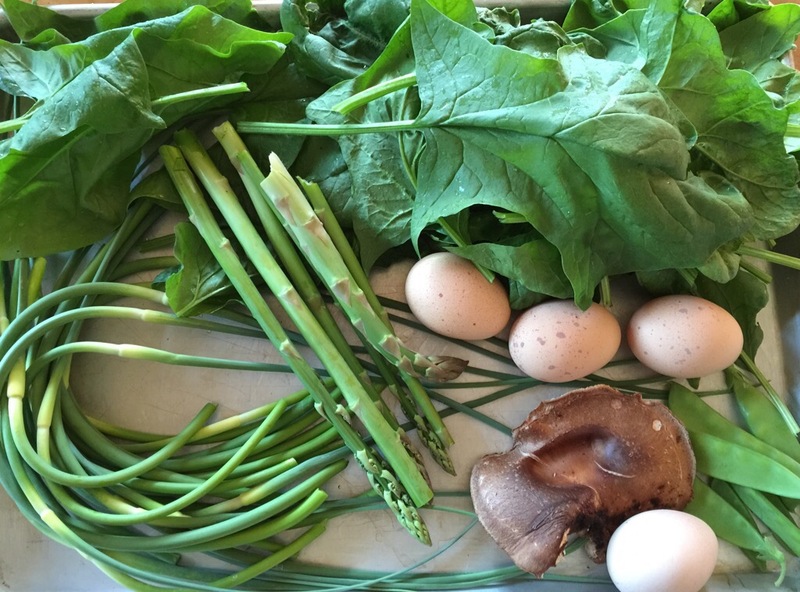 Between the mushrooms, the day lily stalks, and all the lambs quarter I have been cooking it’s quickly becoming a free grocery store out there. Definitely a great way to shop! 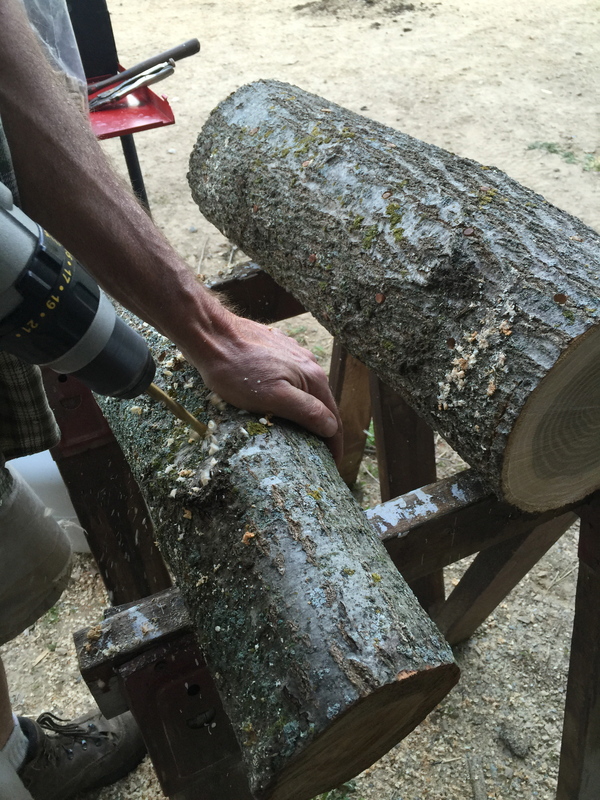 Time to plug the Shiitake logs. Last year’s logs have been giving a few flushes of mushrooms which have been great with all the asparagus we’ve been eating. They are my version of going together like peas and carrots. 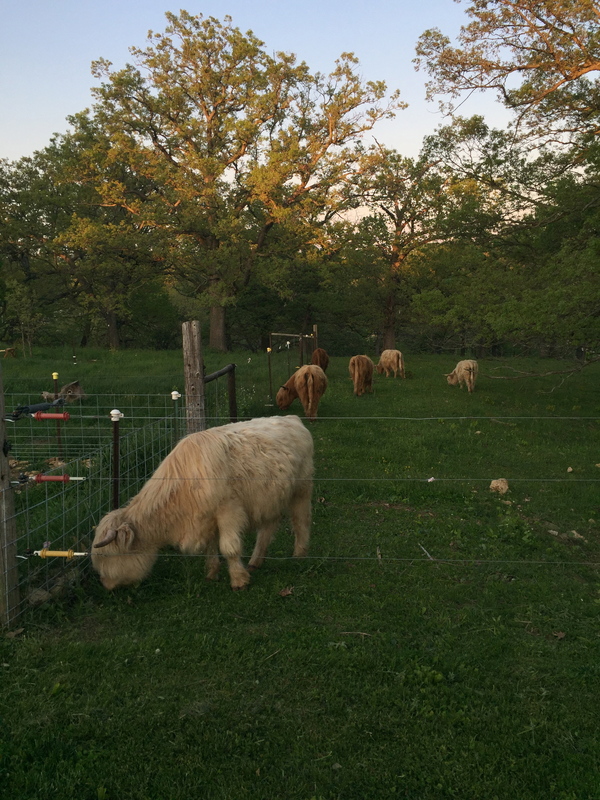 The cattle have been loving the grass and the long summer like nights. I keep counting them, wondering if one day I will go out and there will be 10 instead of 9. Like I said, baby maybe? The cattle are finally up in the woods grazing too these days and so they have earned their first of three purposes, according to my farming rules of livestock each animal has to earn their place on the farm in three ways. So far the cattle have cost money with no real return. Now they are working the woods and cleaning them up which was why we got them originally. It just took a long time to get all that amount of fencing done. My three things I want the cattle to do include feeding us, cleaning up the woods, and to earn cash if we ever sell calves or one of our other cows. 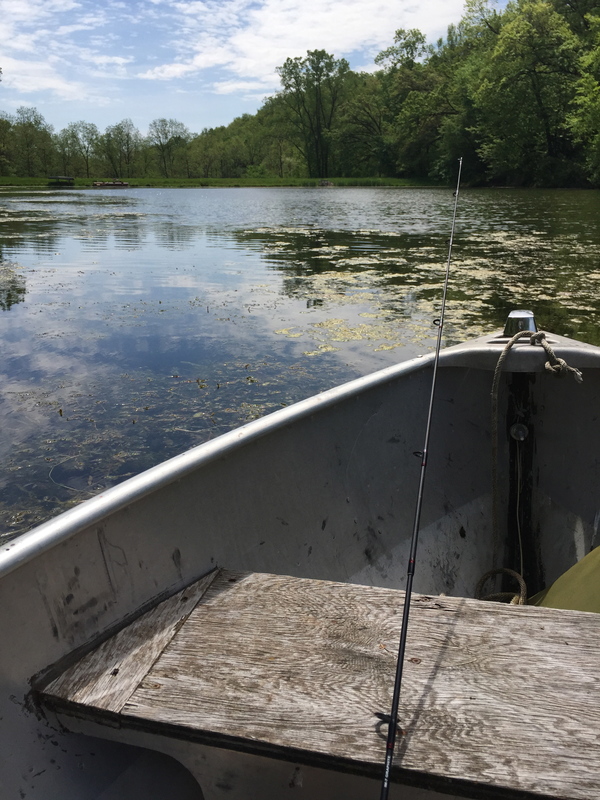 Last weekend we took a bit of time off to fish. Didn’t catch many but it didn’t much matter. I love rowboats.